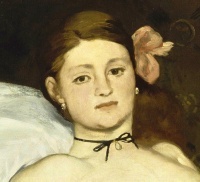 Olympia (detail) by Édouard Manet, painted in 1863, it stirred an uproar when it was first exhibited at the 1865 Paris Salon. Today, it is considered as the start of modern art. "We stand at the threshold of an altogether new art - an art with forms which mean or represent nothing, recall nothing, yet which can stimulate our souls as deeply as only the tones of music have been able to." --August Endell on abstract art The Beauty of Form and Decorative Art, 1897-98. 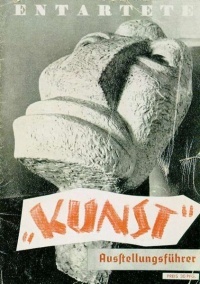 Cover of the catalogue of the Nazi "Degenerate Art Exhibition" (1937). The exhibition was held to defame modern and Jewish artists. On the cover is Der Neue Mensch sculpture by Otto Freundlich. 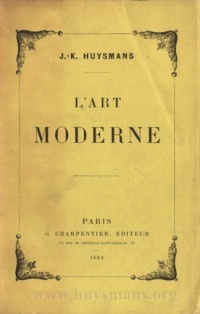 L'Art moderne by Huysmans, Huysmans was also known for his art criticism: L'Art moderne (1883) and Certains (1889). He was an early advocate of Impressionism, as well as an admirer of such artists as Gustave Moreau and Odilon Redon. 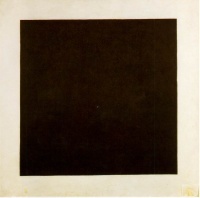 Modern art is a general term used for most of the artistic production from the 1860s until approximately the 1970s. (Recent art production is more often called Contemporary art or Postmodern art). Modern art refers to the then new approach to art which placed emphasis on representing emotions, concepts and various abstractions. Artists experimented with new ways of seeing, with fresh ideas about the nature, materials and functions of art, often moving further toward abstraction. While there is much disagreement on just what constitutes modern art, everyone agrees that it started in 19th century Paris. Walter Benjamin called Paris "the capital of the 19th century". Paris yielded this position of art capital of the world in the 1940s, when the center of artistic activity gravitated towards New York. While in common parlance modern art is usually used to denote art of the early 20th century (Fauvism, Cubism, Expressionism and Futurism), one will have to distinguish between modern art and modernist art. By this token modern art is Delacroix's Romanticism, Courbet's Realism, and Manet's Naturalism. Charles Baudelaire considered Delacroix as the originator of modern art, calling him in his review of the Paris Salon of 1846 "leader of the modern school." Both modern and modernist art were firmly rooted in 19th century France and both are manifestations of the cult of ugliness that opposed the Academic ideal of the beautiful. Although modern sculpture and architecture are reckoned to have emerged at the end of the nineteenth century, the beginnings of modern painting can be located earlier. The date perhaps most commonly identified as marking the birth of modern art is 1863, the year that Édouard Manet exhibited his painting Le déjeuner sur l'herbe in the Salon des Refusés in Paris. Earlier dates have also been proposed, among them 1855 (the year Gustave Courbet exhibited The Artist's Studio) and 1784 (the year Jacques-Louis David completed his painting The Oath of the Horatii). In the words of art historian H. Harvard Arnason: "Each of these dates has significance for the development of modern art, but none categorically marks a completely new beginning .... A gradual metamorphosis took place in the course of a hundred years." The strands of thought that eventually led to modern art can be traced back to the Enlightenment, and even to the seventeenth century. The important modern art critic Clement Greenberg, for instance, called Immanuel Kant "the first real Modernist" but also drew a distinction: "The Enlightenment criticized from the outside ... . Modernism criticizes from the inside." The French Revolution of 1789 uprooted assumptions and institutions that had for centuries been accepted with little question and accustomed the public to vigorous political and social debate. This gave rise to what art historian Ernst Gombrich called a "self-consciousness that made people select the style of their building as one selects the pattern of a wallpaper." The pioneers of modern art were Romantics, Realists and Impressionists. By the late 19th century, additional movements which were to be influential in modern art had begun to emerge: post-Impressionism as well as Symbolism. 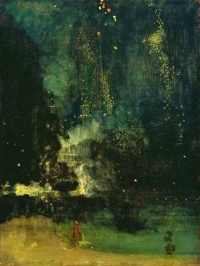 Influences upon these movements were varied: from exposure to Eastern decorative arts, particularly Japanese printmaking, to the colouristic innovations of Turner and Delacroix, to a search for more realism in the depiction of common life, as found in the work of painters such as Jean-François Millet. The advocates of realism stood against the idealism of the tradition-bound academic art -- as testified by the print "Combat des écoles. - L'Idéalisme et le Réalisme" -- that enjoyed public and official favor. The most successful painters of the day worked either through commissions or through large public exhibitions of their own work. There were official, government-sponsored painters' unions, while governments regularly held public exhibitions of new fine and decorative arts. The Impressionists argued that people do not see objects but only the light which they reflect, and therefore painters should paint in natural light (en plein air) rather than in studios and should capture the effects of light in their work. Impressionist artists formed a group, Société Anonyme Coopérative des Artistes Peintres, Sculpteurs, Graveurs ("Association of Painters, Sculptors, and Engravers") which, despite internal tensions, mounted a series of independent exhibitions. The style was adopted by artists in different nations, in preference to a "national" style. These factors established the view that it was a "movement". These traits—establishment of a working method integral to the art, establishment of a movement or visible active core of support, and international adoption—would be repeated by artistic movements in the Modern period in art. Among the movements which flowered in the first decade of the 20th century were Fauvism, Cubism, Expressionism and Futurism. World War I brought an end to this phase, but indicated the beginning of a number of anti-art movements, such as Dada and the work of Marcel Duchamp, and of Surrealism. 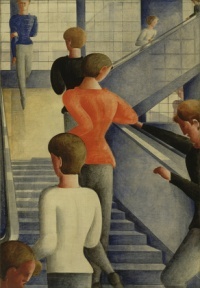 Also, artist groups like de Stijl and Bauhaus were seminal in the development of new ideas about the interrelation of the arts, architecture, design and art education. 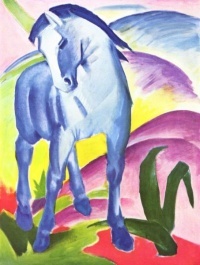 Modern art was introduced to the United States with the Armory Show in 1913, and through European artists who moved to the U.S. during World War I. It was only after World War II, though, that the U.S. became the focal point of new artistic movements. The 1950s and 1960s saw the emergence of Abstract Expressionism, Color field painting, Pop art, Op art, Hard-edge painting, Minimal art, Lyrical Abstraction, Postminimalism and various other movements; in the late 1960s and the 1970s, Land art, Performance art, Conceptual art and Photorealism among other movements emerged. Around that period, a number of artists and architects started rejecting the idea of "the modern" and created typically Postmodern works. Starting from the post-World War II period, fewer artists used painting as their primary medium; instead, larger installations and performances became widespread. Since the 1970s, new media art has become a category in itself, with a growing number of artists experimenting with technological means such as video art. Shaped canvas - Frank Stella, Kenneth Noland, Ron Davis, Robert Mangold. Unless indicated otherwise, the text in this article is either based on Wikipedia article "Modern art" or another language Wikipedia page thereof used under the terms of the GNU Free Documentation License; or on original research by Jahsonic and friends. See Art and Popular Culture's copyright notice. This page was last modified 18:26, 7 December 2018. This page has been accessed 23,347 times.